The Stanneylands hotel at Manchester airport is an elegant country house set in the county of Cheshire, and one of our most popular Manchester airport hotels. Nestled in a leafy green eden, surrounded by vast stretches of farmland, this grand property is an exquisite couples retreat into the English countryside. The 16th century origins of the hotel combine vintage refinement with modern amenities such as the free WiFi throughout, allowing you to escape the day-to-day without ever being out of touch. Very noisy, could hear both adjoining rooms tv's word for word and there was a disco so very hard to get any sleep, not good before an early flight out of Manchester. However a lovely setting, good staff and a lovely room but just too noisy for us. Great shame. Brilliant hotel with excellent facilities and great private taxi transfers. 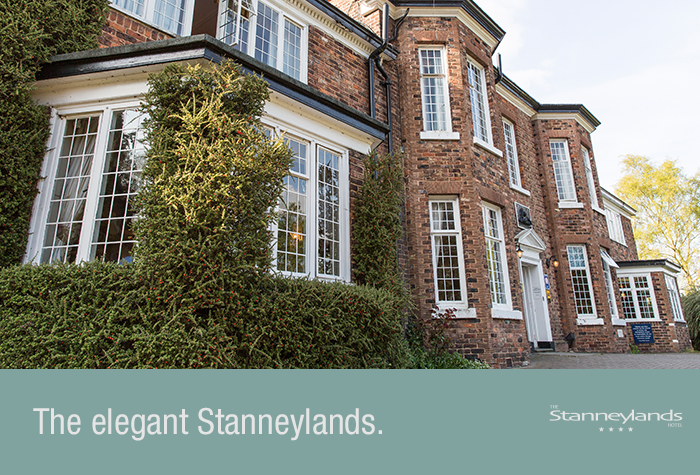 Our customers rated Stanneylands on average 9/10 (115 reviews). Read Stanneylands reviews. 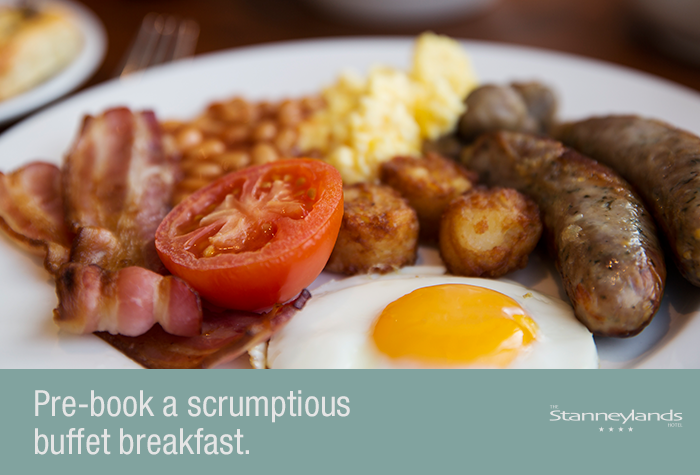 Aside from the impressive setting and tasteful interior design, the Stanneylands triumph is its impeccable cuisine. The traditional restaurant offers elegantly presented, modern British food, which has earned it two AA rosettes for superior quality and delectable choice. When plane food is the next thing youll be tucking into, this restaurant will certainly leave you imploring more. 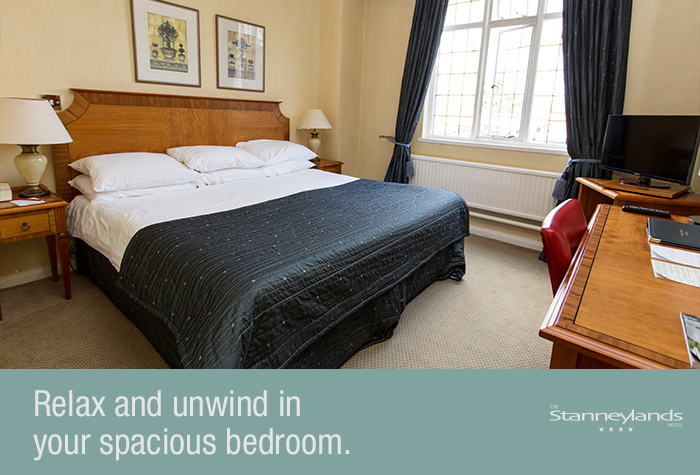 Ease into 4-star comfort and countryside tranquility as you enjoy the peaceful surroundings and exemplary hospitality at the Stanneylands. Visit this exclusive Manchester airport hotel for fine-dining, a sound nights sleep and free transfers to add a little luxury to your holiday. Foodies - Anyone who likes their food cant fail to be blown away by the double AA rosette award-winning restaurant. Families - The Hilton is very popular with families, and it's easy to see why. The family rooms are large and luxurious - options include connecting rooms, bunk beds and cots. Children under 10 eat free from the Garden Restaurants special childrens menu, or if you prefer to order room service, some family rooms have a dining table. Children's movies are available too, so you can keep the little ones entertained. A tranquil getaway - Ideal for a romantic mini-break, couples can enjoy this secluded spot and its enchanting surrounds. An exceptional stay - The Stanneylands hotel near Manchester airport was one of the three hotels to be nominated for Hotel of the Year by Cheshire Life, and has been awarded Highly Commended hotel of the year 2011. Elegant, luxurious and nestled in the countryside, Stanneylands is ideal for a relaxed start to your holiday - and it's just 3 miles from the airport. 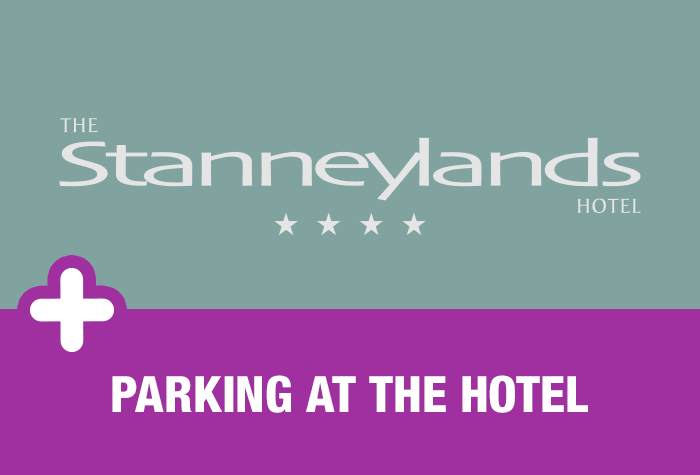 You'll be leaving your car at Stanneylands' secured car park on the hotel grounds, and you'll need to leave your keys with the hotel. Stanneylands is an idyllic hideaway in the heart of the Manchester countryside - you wouldn't guess you're only 3 miles from the airport. It's the perfect escape from the hustle and bustle of the airport scene, but close enough that you'll be at check-in within 10 minutes. You'll be taken care of from the time you arrive to the time you leave. 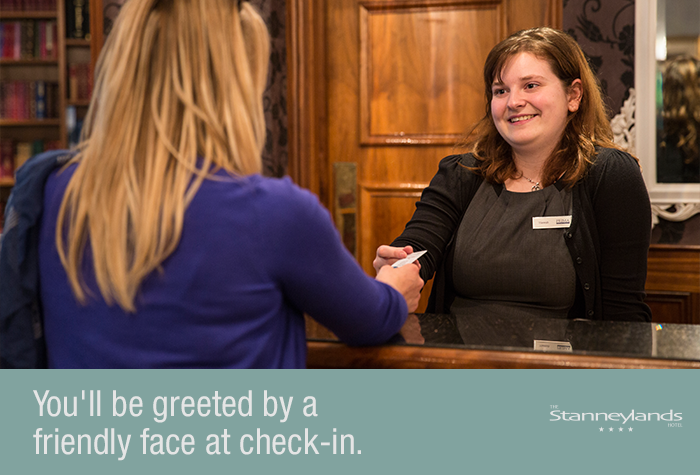 Check-in is from 14:00 so you can arrive as leisurely as you like. 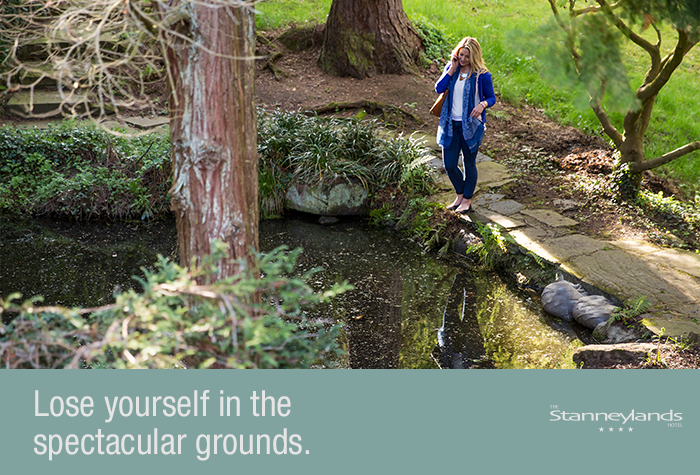 Lose yourself in the spectacular grounds; the beautiful pond and woodland are waiting to be explored. Or, if you'd rather explore indoors, there's a charming library full of classics, so you can curl up on one of the cosy couches and enjoy some 'me time'. 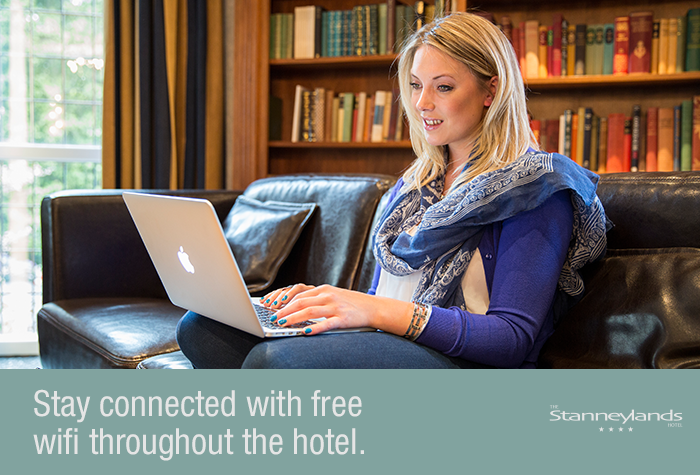 There's even free wifi throughout the hotel, so you can keep connected. 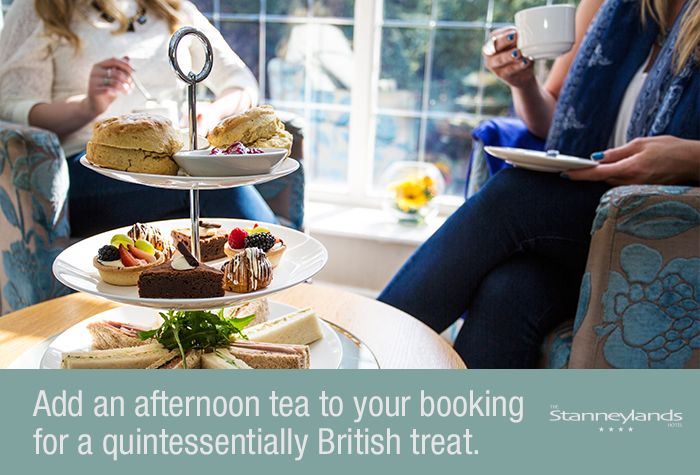 A charming afternoon tea with sweet treats is served in the lounge. Finger sandwiches, scones with jam and clotted cream, fruit tarts and brownies are all served with a cup of freshly brewed tea. It's served daily from 15.00 to 17.30. 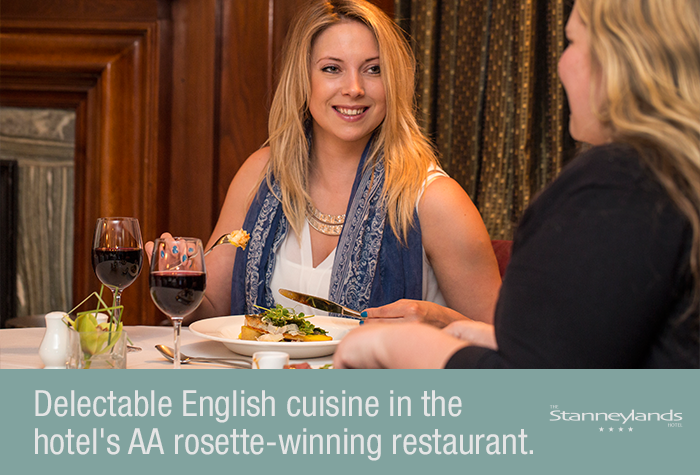 The hotel's AA rosette-winning restaurant serves delectable English cuisine. 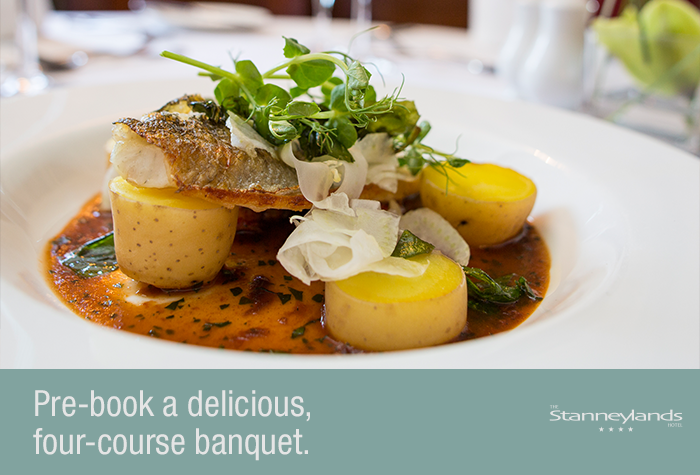 Treat yourself to four delicious courses and save money when you pre-book with us. The food is exquisite and expertly prepared: from prawns to steaks, soups to salads, garnished to perfection. 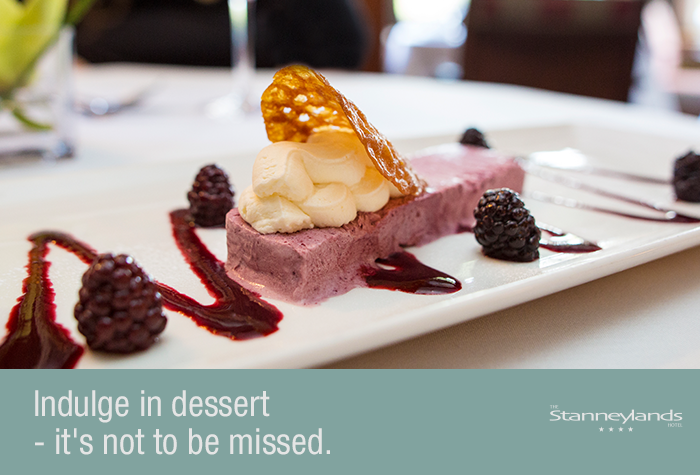 Indulge in dessert too - it's not to be missed. Dinner is served daily from 19:00 to 21:45. 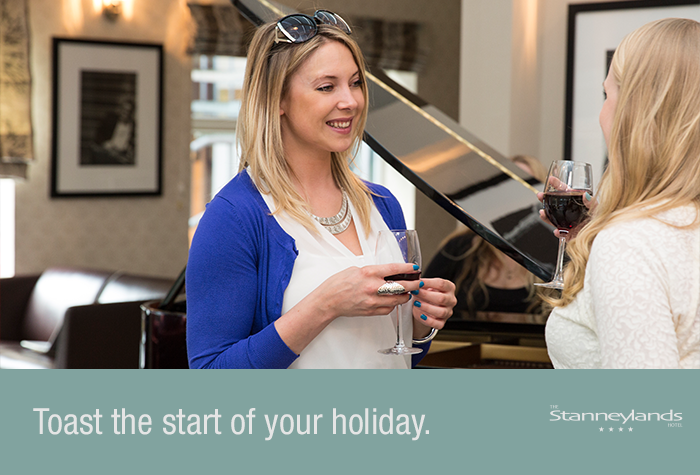 Kick back with a glass of wine in the hotel's bar - there's even a piano to keep you entertained. 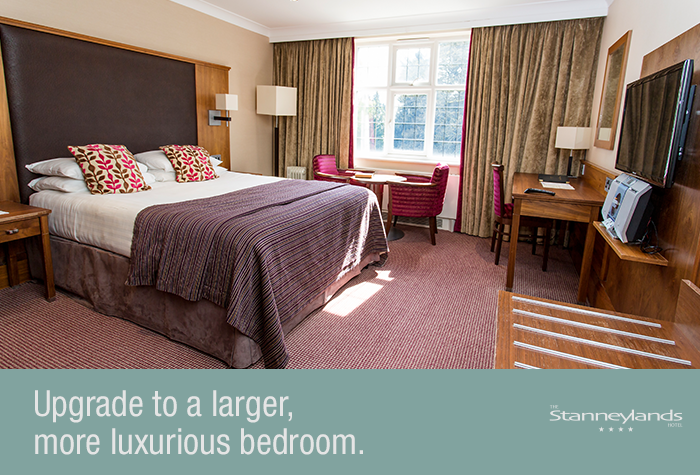 When bedtime beckons, you'll find a spacious bedroom where you can relax and put your feet up. You can even upgrade to an executive room for a little more luxury. A delicious buffet breakfast is served up in the morning. Tuck into all of your favourite English and continental favourites. It's served from 07:00 to 10:00 on Monday to Friday and from 07:30 to 10:00 at the weekend. Transfers to the airport are by taxi and can be booked at the reception. They're included in the price and take about 10 minutes to get to the airport.